Hardly any other industry has set itself such ambitious climate protection targets as the aviation industry. Airlines, aircraft manufacturers, air traffic control services and airports all over the world agreed on a climate protection strategy as early as 2009, focused on the reduction of carbon dioxide. In the long term, climate-neutral flying should be possible. Germany has been an aviation nation from the very beginning. Pioneers such as Graf Zeppelin, Otto Lilienthal and Hugo Junkers have written aviation history. Over the decades, air transport has evolved from a luxury for the wealthy to an attractive mode of transport for many. According to a representative survey by Forschungsgruppe Wahlen e.V., Germans like to fly, but almost a third of them say that they tend to have a guilty conscience for environmental reasons. Hence a legitimate question is: what about environmental and climate protection in aviation? Airlines, aircraft manufacturers, air traffic control services and airports all over the world agreed on a climate protection strategy as early as 2009, according to which fuel consumption is to be reduced by 1.5 percent per year and from 2020 the growth of air traffic is to be CO2-neutral. 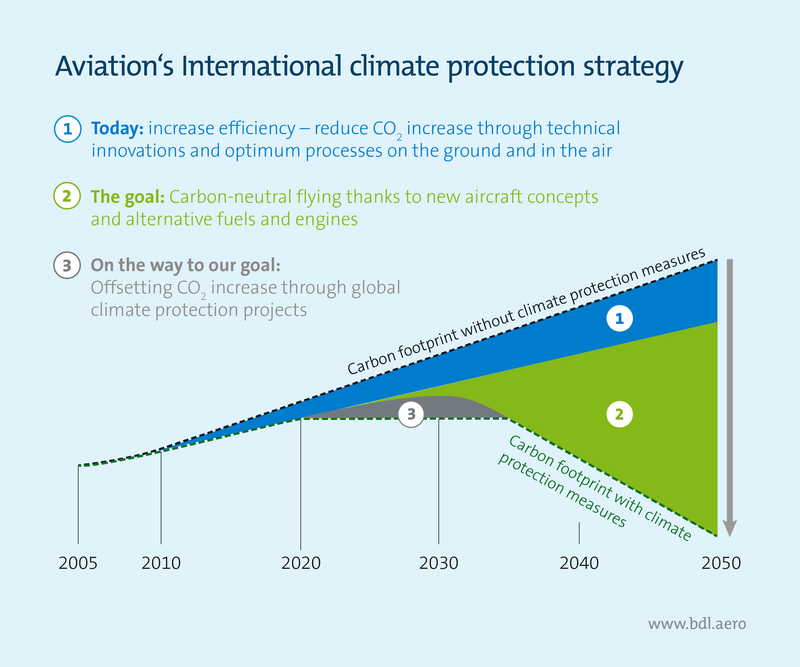 The target is also to halve net CO2 emissions from aviation by 2050 compared to 2005. Would you have known? 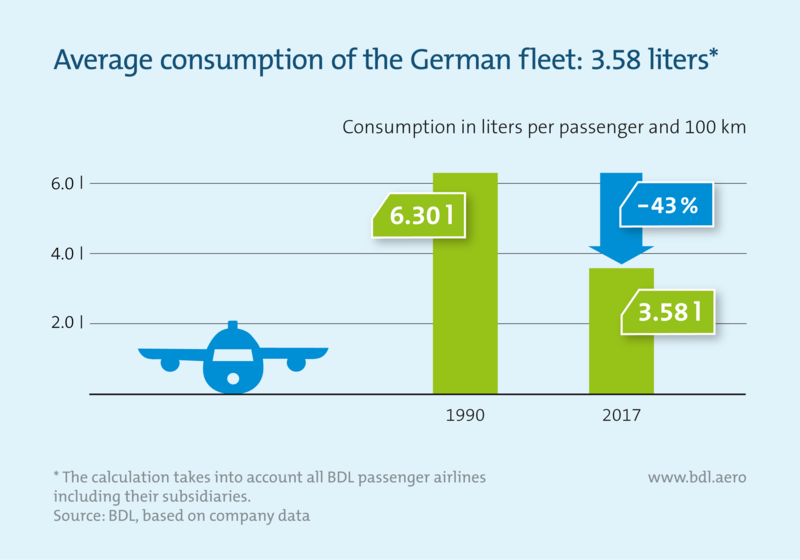 German aviation is one of the pioneers when it comes to energy efficiency: no other industry has improved its fuel consumption per passenger in recent years as much as aviation. Today, Germany’s modern air fleet consumes an average of 3.58 liters of kerosene per 100 kilometers and passenger. This is 43 percent less fuel than in 1990. By reducing the specific energy requirements of aircraft, kerosene consumption and thus CO2 emissions are reduced. And one more thing distinguishes German airlines from other modes of transport: no external pressure is necessary for their commitment. Kerosene accounts for up to one third of operating costs. It is therefore in the interest of the airlines themselves not only to act economically but also ecologically. In order to reduce fuel consumption and thus the CO2 emissions of an aircraft, many parameters have to be taken into account. The most important of these are engines, aerodynamics and new materials. 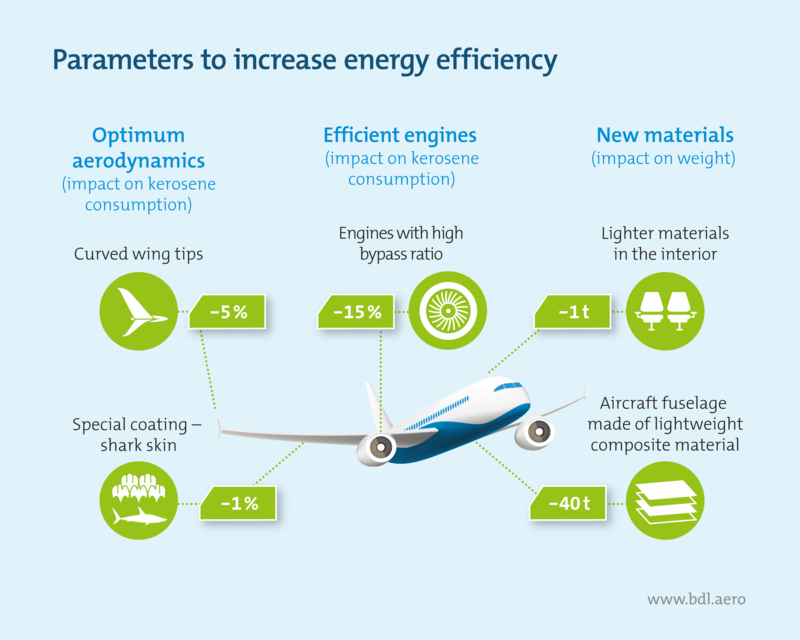 Technical innovations ensure that fuel consumption is reduced by up to 25 percent with each new generation of aircraft. So the most effective investments are in new aircraft. German airlines are continuously making that investment: currently in 242 more fuel-efficient aircraft at a total list price of €39 billion. In addition to technical innovations, streamlined operational processes on the ground and in the air and the implementation of the Single European Sky will lead to a further reduction in fuel consumption. In order to be able to fly carbon-neutral in the long term, the development of alternative fuels and engines is needed, as well as political support to make their application marketable. From a technical point of view, the use of alternative fuels in air traffic is already possible, and some airlines are using them today on their routes. But these fuels are still many times more expensive than conventional kerosene. In addition, alternative fuels have long been unavailable in sufficient quantities and are generally produced in small quantities in research and pilot plants. A great deal of research and political effort is still needed to bring real alternatives to conventional kerosene to market maturity. In addition to fuels, research in the field of aircraft concepts and engines is also constantly being advanced. Even today, intra-European air traffic is growing carbon-neutral, as international flights within Europe have been covered by the European emissions trading system since 2012. Originally, all cross-border flights departing from airports within the EU were to be charged a corresponding compensation fee. However, it was evident after the introduction of the emissions trading system for aviation in Europe that many countries, including the USA, China, Russia and India, are opposed to European emissions trading. These countries criticize the European system because they regard it as an interference in their own state sovereignty. In order not to jeopardize the agreement at the international level, the European Commission has restricted emissions trading for 2012 to intra-European flights. A number of climatic parameters must be taken into account to make climate-neutral flying possible in the long term. First and foremost are the CO2 emissions generated by the combustion of kerosene in the engines. These must be reduced with the help of new, more economical technologies and lower-emission alternative fuels, such as power-to-liquid fuels. However, aircraft produce not only carbon dioxide but also other greenhouse gases and air pollutants. Emissions of nitrogen oxides in particular must be considered when assessing the climate impact of aviation. In addition to CO2 and NOx emissions, the generation of condensation trails and the associated change in cloud formation must be weighed when assessing the climate impact of air traffic. To avoid condensation trails, there are ideas on how to fly around areas where they occur – for example by adjusting the flight route and altitude. 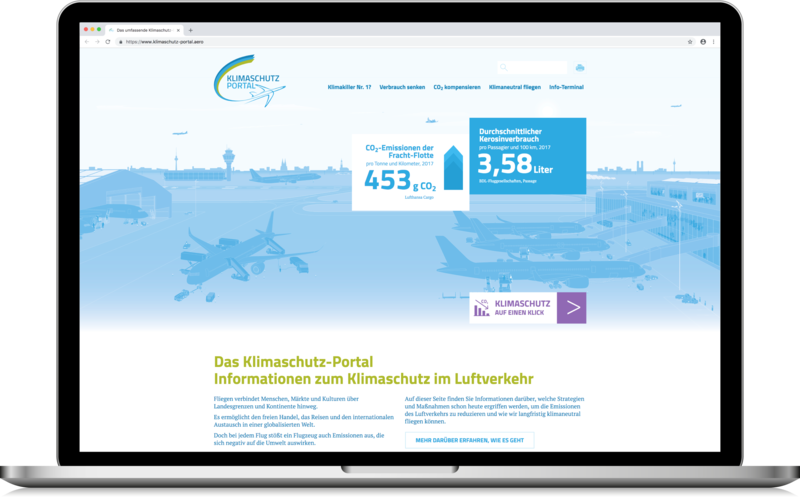 The latest news, as well as many facts and diagrams on the subject of climate protection in aviation, is available at the knowledge portal www.klimaschutz-portal.aero.